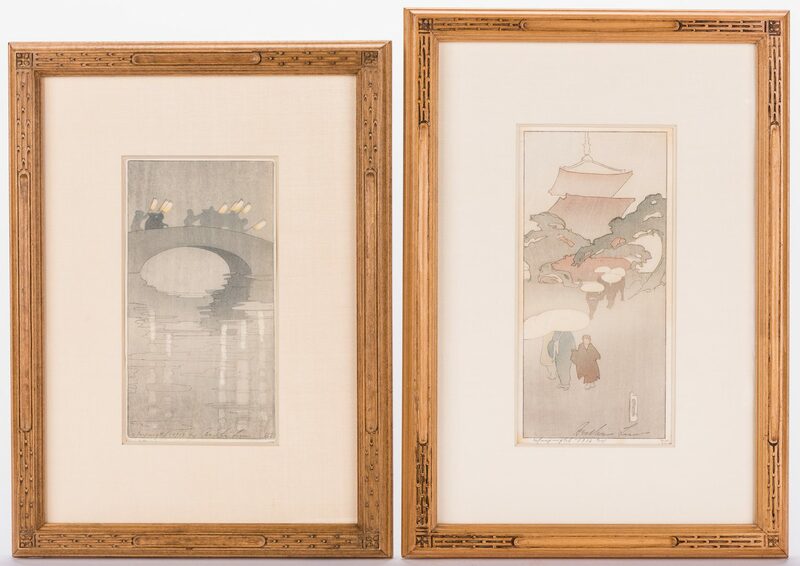 Two (2) Bertha Lum (California/Iowa/Italy, 1869-1954) Japanese style color woodblock prints. 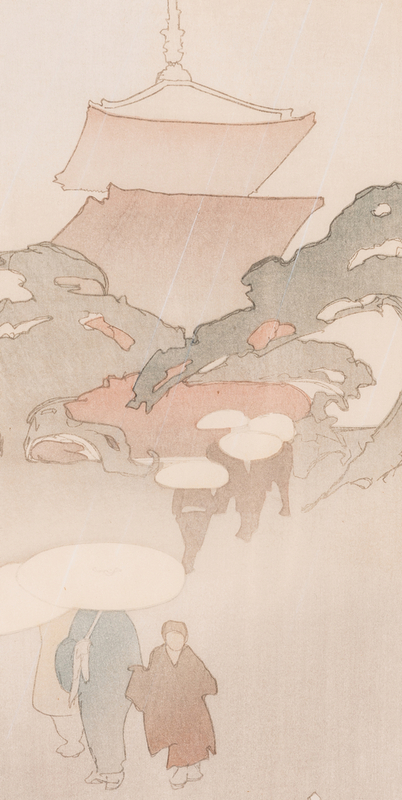 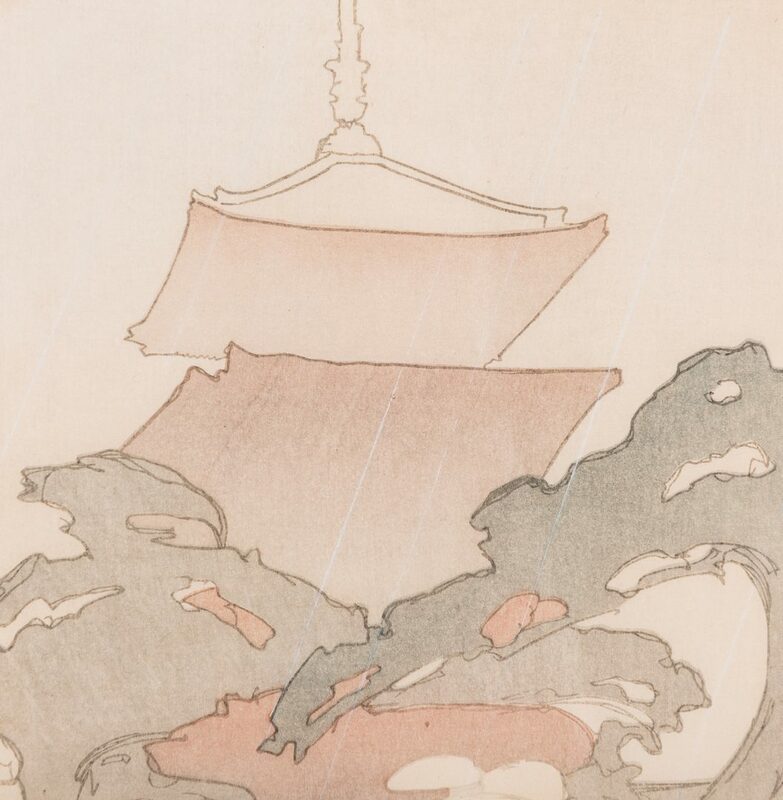 1st item: Woodblock print on paper titled "Figures in the Rain" depicting several figures in a light rain shower, leaving a temple or shrine, the top of a pagoda visible in the background. Printed monogram signature and signed in pencil, lower right in the image. 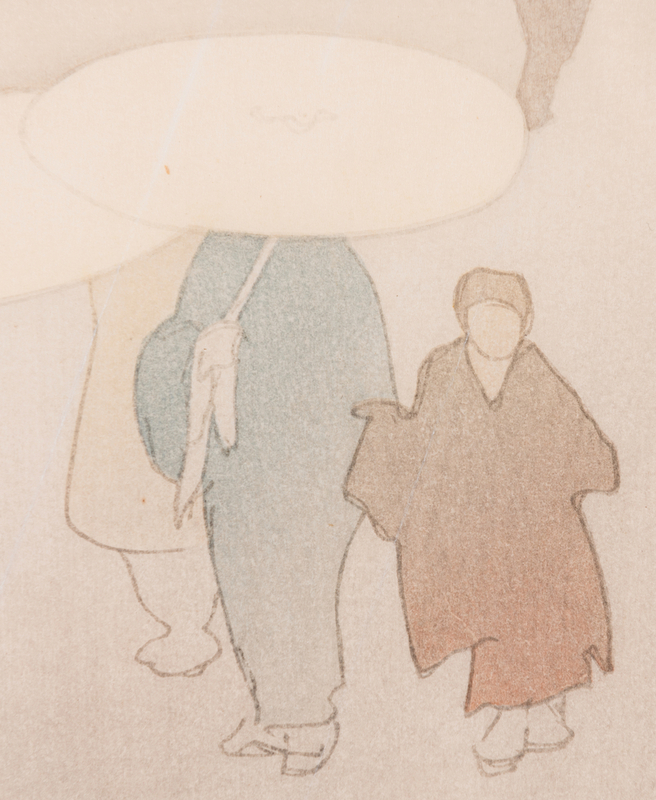 Illegible writing, possibly the title and additional signatures, with date "1916", lower left and right under image. 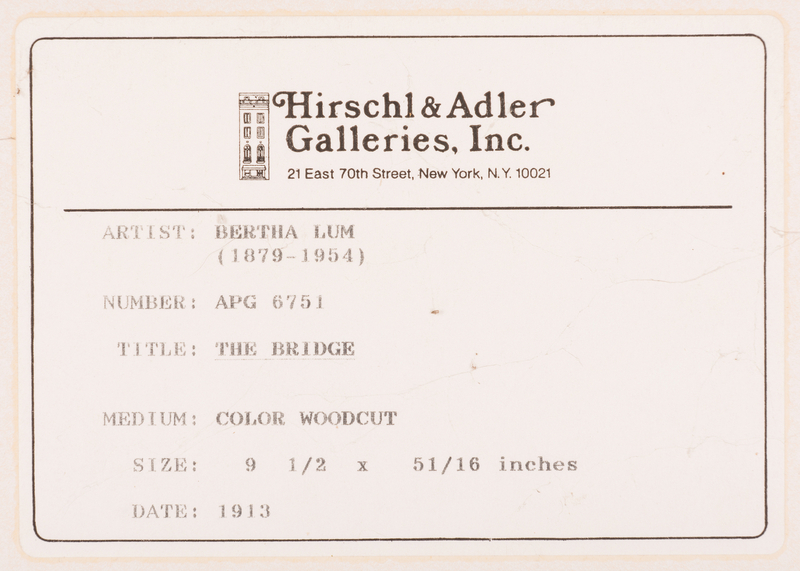 Two Hirschl and Adler Galleries, Inc., New York, New York gallery labels with artist name, title, date, and additional information, en verso. Housed in a decorative carved wooden frame. 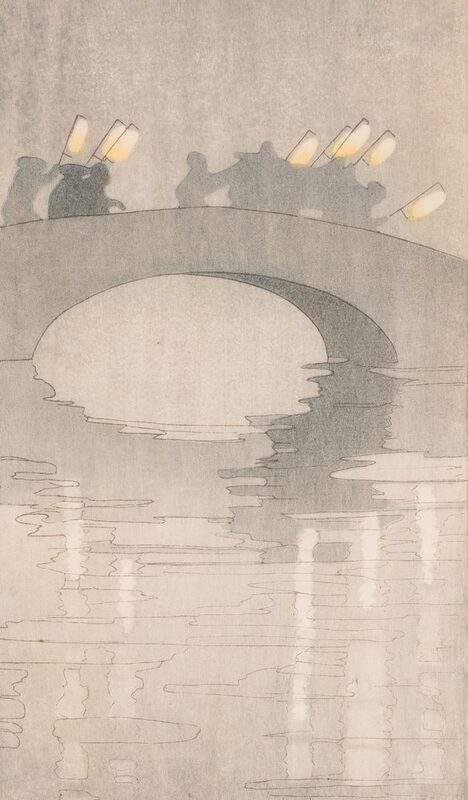 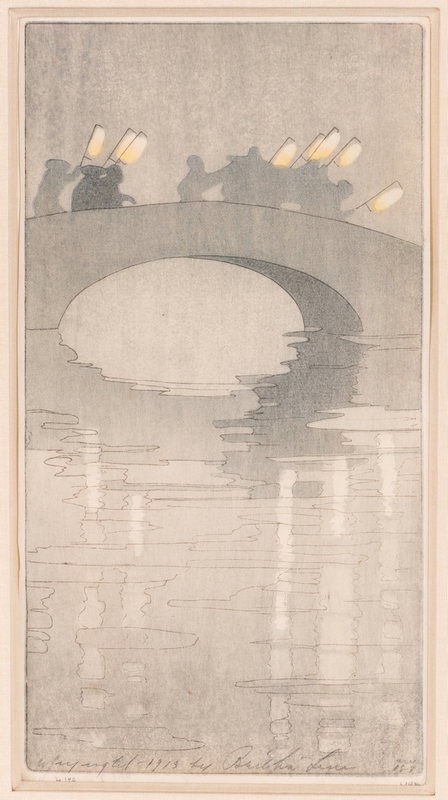 Image – 10 1/2" H x 4 3/4" W. Sight – 10 3/4" H x 5 3/8" W. Framed – 18 3/4" H x 13 1/4" W. 2nd item: Woodblock print on paper titled "The Bridge" depicting a group of figures with lanterns crossing a bridge at night. 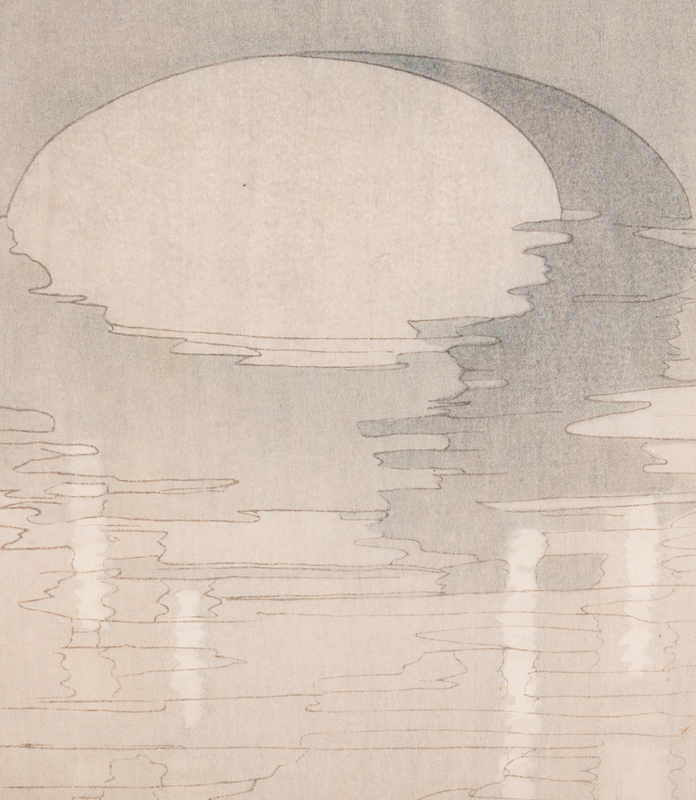 Signed and dated "1913" with possible title and number, in pencil, across lower edge inside of image. 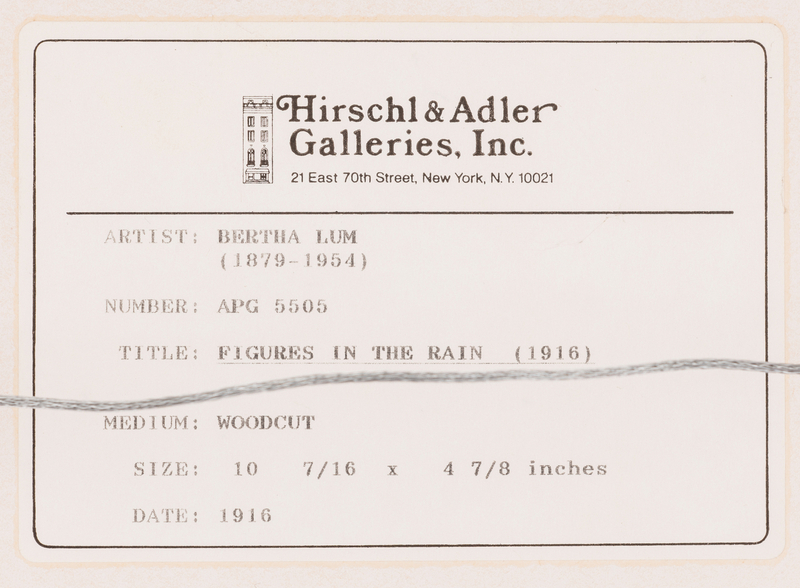 Additional numbers, in pencil, lower left and right under image. Hirschl and Adler Galleries, Inc., New York, New York gallery label with artist name, title, date, and additional information and additional information label, en verso. 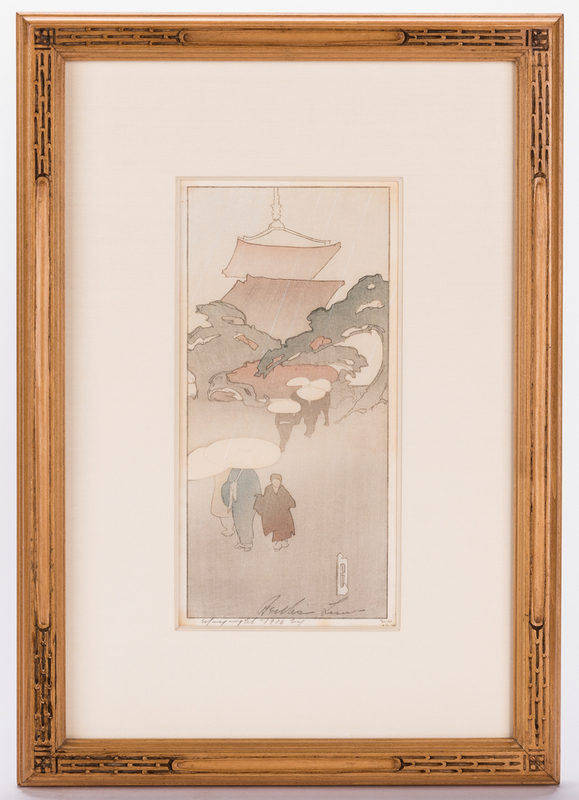 Housed in a decorative carved wooden frame. 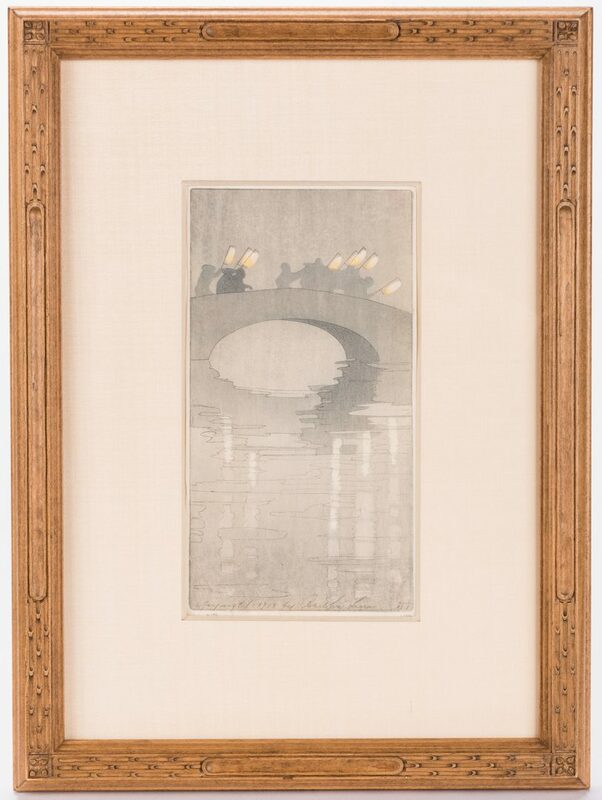 Image – 9 1/2" H x 5 1/8" W. Sight – 9 3/4" H x 5 1/4" W. Framed – 17 3/4" H x 13 1/8" W. Early 20th century. 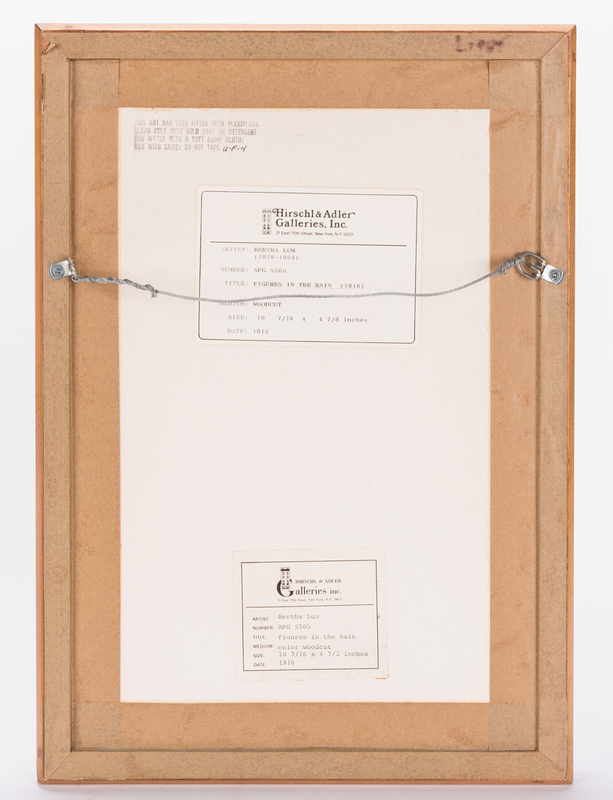 Provenance: The Living Estate of Rita Whittle, Maryville, TN. 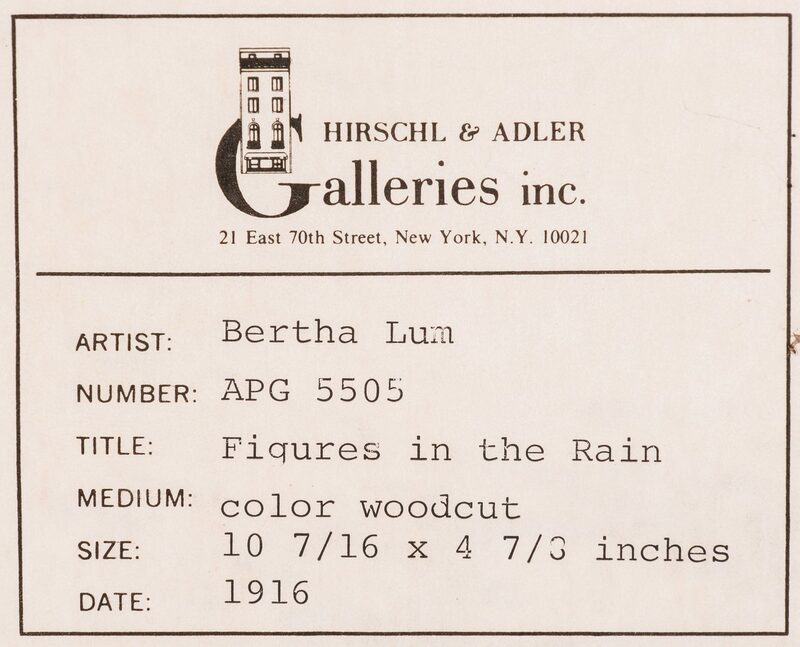 CONDITION: Overall good condition. 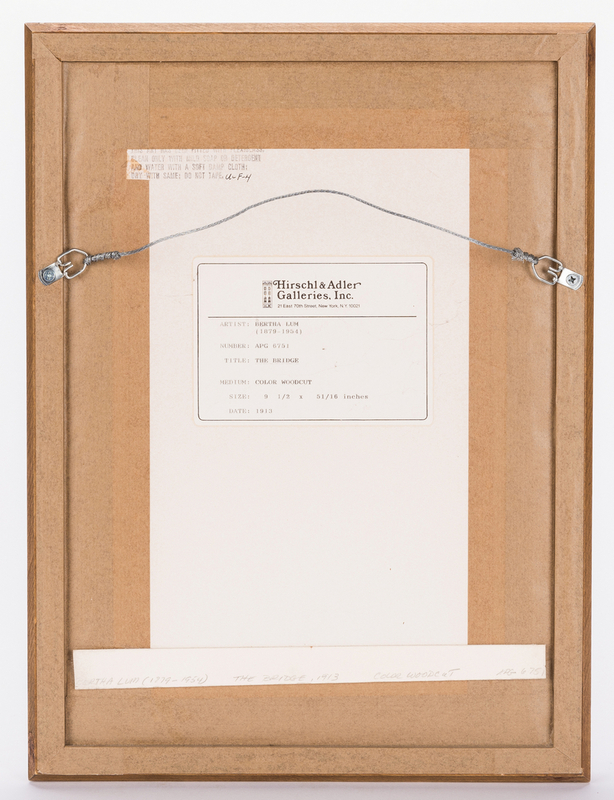 Not examined outside of frame. 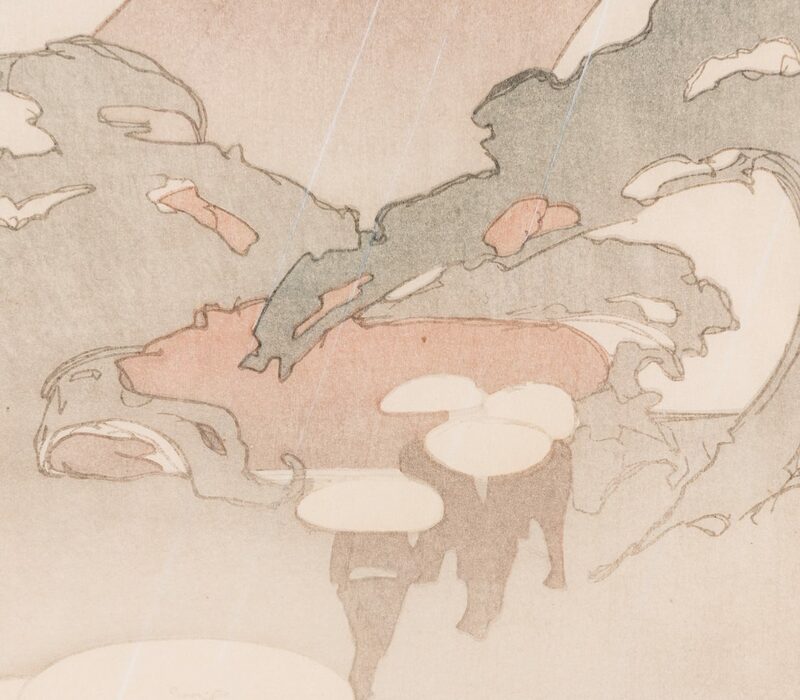 1st item: Areas of toning, around edges of image (does not appear to affect image). 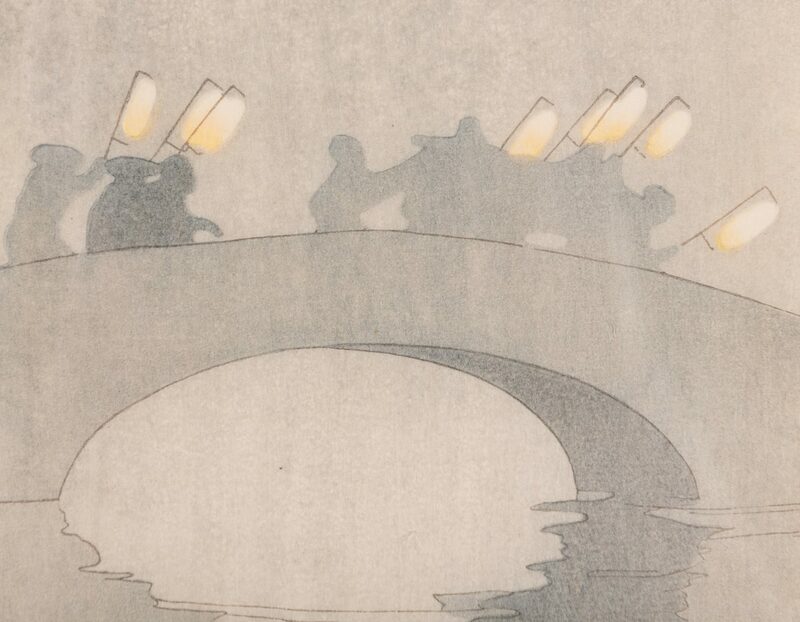 2nd item: Sheet has been cut down, evident center right near bridge.